I’m officially in that obsessed-can’t-think-of-knitting-anything-else stage. all make for a “can’t put it down” project. I tried it on last night and LOVE the collar. I think I’m more excited about the collar right now than the cable. It does need some blocking so it doesn’t curl but I kinda like it like this right now because I get to see more of the back’s cable this way. 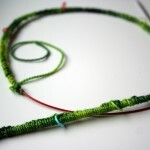 It’s surprisingly efficient with yarn usage too – I got almost the whole yoke out of just one 215 yard skein. I’m ready to start the body now and you know what that means – quicker progress. Of course, I will still have to go back and do the sleeves when the body is done, but they go quickly, right? Feel free to lie to me. Oh i L.O.V.E. it!!! Just gorgeous! 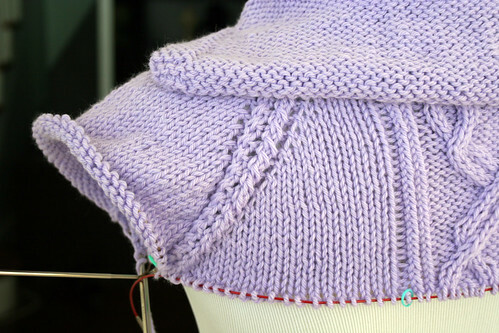 Im on the sleaves of a cardi at the moment, and i hate to break it to you….but progress is sooooo slow…when your so close to finishing but soooooo distracted by other things???! But im sure yours will be COMPLETELY different…???! haha doubtful – i get bigtime distracted by all the things – and this yarn just came in the mail yesterday. 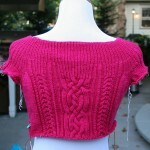 Oh the yarn and color and cables are a-mazing! 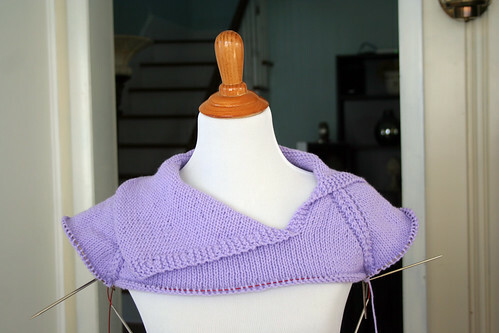 As for the sleeves, what works the best for me is to work the sleeves both at the same time on separate needles. Until the first decrease on one, switch, do the same on the other one, switch, work again a little, switch…. that’s the only way for me to have full lenght sleeves on my sweaters. go go! 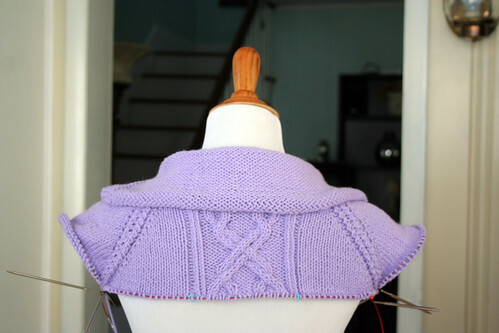 Jody it’s looking fantastic and that color is perfect for showing off the cables. What a beautiful project so far! I love reading your enthousiasm! I’m in love with that collar, too!! 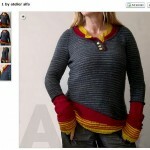 Love that you are focused on this beautiful knit. Very inspiring. You’ve hit knitting zen! I love when that happens. 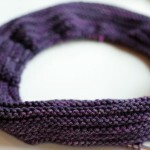 It’s almost sad to finish a project when you have such great knitting zen.